February is the month we think about the heart the most. February is American Heart Month along with Valentine’s Day. The heart is a complex organ that keeps us alive and in love. It is an organ that needs to be cared for and not taken for granted so that we all can live a long and healthy life. As humans we do our best to stay active and eat healthy. We don’t usually think of heart disease when it comes to our pets. Did you know that dogs also can suffer from heart disease? Heart disease can come at any time in a dog’s life. Some have inherited their heart disease and for others it can develop due to age or improper diet and lack of exercise. Regular visits to the veterinarian are important along with daily exercise for a minimum of 30 minutes and avoiding high fat and high caloric treats and food. Reading the ingredients and fat contents of your pup’s daily food is important. Know what they are consuming. Look up any ingredients you do not understand. Call the manufacturer with any questions you have and let your veterinarian know what your dog is eating. 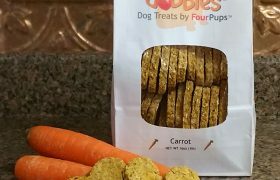 I have always believed that the more natural and whole the ingredients are, the better for your pup. My dog’s food is an oat based kibble. I wanted my Dobbles™ to match it. 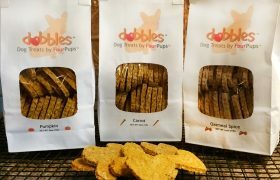 Dobbles™ main ingredient is oats. Oats are a natural whole grain found in many dog foods. It is a great natural source of iron, manganese, zinc and B vitamins as well as essential fatty acids and antioxidants.The protein in oats is an ideal partner to the meat proteins found in all of your dog’s foods. It contains almost a complete list of the essential amino acids (the building blocks of protein) vital to a complete and balanced diet. Many veterinarians feel that the protein in oats is very hypoallergenic (less likely to cause an allergic reaction) and therefore an ideal nutrient to be included in a diet formulated for dogs suspected of having a food sensitivity or allergy. The natural high fiber content in oats, pound for pound, contains less carbohydrate calories than other grains. This makes it an ideal ingredient to support weight management as well as helping lower cholesterol. Another plus to oat’s fiber, optimum bowl function. 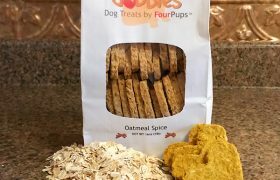 The soothing properties of oatmeal can help a dog with some digestive issues. 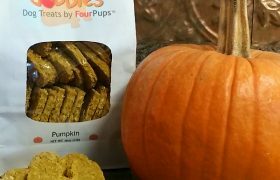 Natural antioxidants in oats help your dog from the toxins in our environment thought to be responsible for many of the diseases and conditions seen in pets. 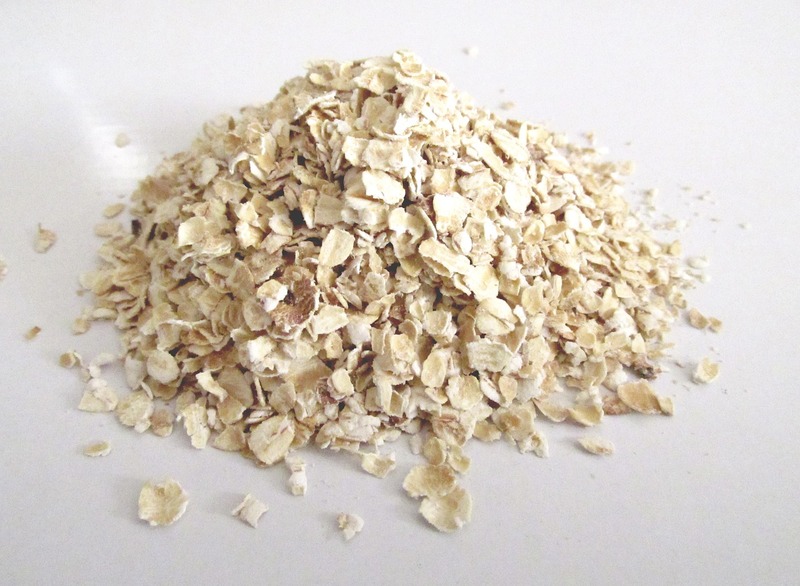 Oatmeal has a very low glycemic index, and is lower in glutens than most grains. Both are important in controlling blood sugar levels and reducing digestive issues for pets.